Volume – a full service B2B digital and innovation agency – has been recognised in the Drum Digital Census as the winner of the Client Feedback for agencies with 100+ digital staff category. The announcement is significant because it follows a partnership with cloud-based loyalty platform CustomerGauge to strengthen its client relationships with a B2B Net Promoter® program. Volume uses the CustomerGauge system to automate the survey process, analyse results, and align the organisation to the voice of the customer. Since implementing the program in January 2012, the agency has seen its Net Promoter Score increase substantially among key accounts, and feedback gained from customers has helped increase client retention and enhance relationships. Net Promoter is based on two questions – "On a scale of 0 to 10, would you recommend this business to a colleague or friend?" and a follow-up question designed to uncover the reasons for the score and gain feedback that can be used to make customer-focused change. Respondents that give a score of 0 to six are considered 'Detractors', those that score seven or eight are 'Passive', and those give nine or 10 are 'Promoters'. 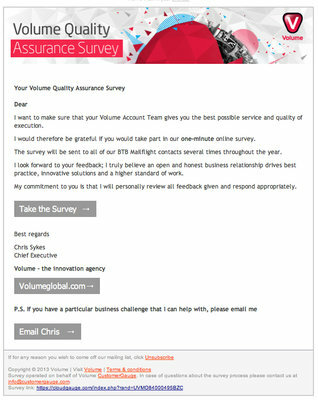 Due to the fact it has been tracking and incrementally building on its Net Promoter Score for a period of time, Volume had objective data to support its internal belief that it could perform well in any situation in which clients were asked to rate the agency. "At Volume we pride ourselves on our ability to meet and exceed our clients' expectations, so I am delighted by this recognition," said Chris Sykes, Chief Executive, Volume. "We have always been dedicated to nurturing customer loyalty on a systematic level throughout the life of the organisation. We have found since the implementation of our Net Promoter program, our progress has been reflected in our scores which was a forward indicator of this award win."